Krivi offers DFI compatible DDR PHYs to best fit in your SoC with reasonable cost and time. Our DDR PHYs are available in hardened and semi-soft formats to suit your requirements. 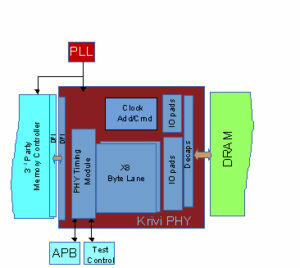 Our advanced silicon proven PHY solution takes care of all the complex DDR timings using fine step analog DLL and jitter tolerant training algorithms. Along with partner companies, we provide complete DDR solution including Memory Controller, DDR VIP and package SI/PI sign-off. We have experienced Digital, Analog, IO pad, CAD and Hardening teams working next to each other. It helps to optimize and provide best-in-class DDR PHY with least Power and Area. Supports all current DDR PHY standards: DDR4/3/2, LPDDR3/2. LPDDR4 to be available soon. We have consistently achieved first time working IP thanks to rigorous verification environment that includes uncertainty enabled VIP, mixed mode simulation for Analog blocks and co SI/PI simulation of critical path from PHY PLL to DRAM ball.